Image caption The judge described Morgan's actions as "shambolic"
A "devious" councillor who gambled away thousands of pounds in Las Vegas which he stole from a 92-year-old woman has been jailed for five years. 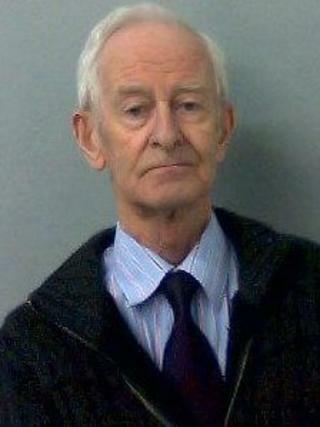 John Morgan, who was a Conservative Vale of White Horse member at the time, stole £154,000 from Beryl Gittens, from Berkshire, between 2004 and 2012. Morgan, 75, of Highclere Gardens, Wantage, Oxfordshire, claimed he had acted according to her wishes. The judge said his "devious" actions were a "breach of trust". Mrs Gittens has since died. Speaking outside Oxford Crown Court, the victim's sister-in-law Audrey Pagett said Morgan had got what he deserved. She added: "I'm pleased it's all over... that's the end of it now, I shall forget it. "She trusted him so completely and she would have been so upset... I wouldn't have wanted her to know [the truth]. It's better that she didn't know. "I never trusted him from the word go, ever." Morgan, also a Wantage town councillor, resigned from the Tory group after being found guilty last month. He said Mrs Gittens had told him to spend the money because she did not want her family arguing over it after her death. He spent the majority of the cash on gambling slot machines at service stations and in Las Vegas, the court heard. Suspicions were aroused after Mrs Gittens' death when there was not enough money to pay for her funeral. Judge Mary Mowat said she had taken into account Morgan's age, and his council and charity work, when passing his sentence. But she said it was in "strange and startling contrast to the devious and shambolic way" that he dealt with the affairs of Mrs Gittens. She described Morgan as a gambling addict who justified his actions to himself by making out that the victim's family had abandoned her. She added: "You did this when you had an enduring power of attorney. In my view there is no grosser breach of trust. "You made out like you were her only true friend."